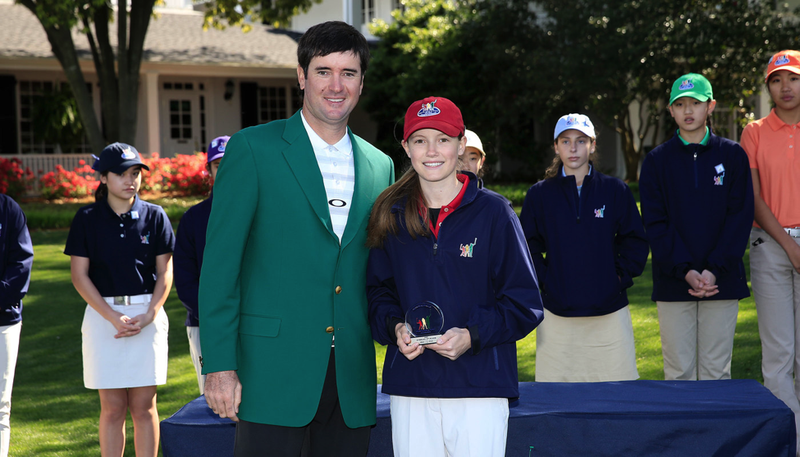 IVLA Student, Ashley Gilliam, a 13 year old from Tennessee, goes out to play every day – play golf that is! Ashley, who has been playing golf since she was 6, spends several hours a day on the greens. “I love the competitive feeling of me versus the course,” says this ambitious middle school athlete who dreams of playing golf in college and perhaps a professional golf career. No doubt exciting plans for the future but the present is none too shabby either! Ashley just returned from Drive, Chip and Putt National Finals at Augusta National Golf Club, home of the Masters Tournament. In this competition, 50,000 golfers ages seven to fifteen vie for coveted positions at the national level. After three qualifying rounds, 40 boys and 40 girls hit the fairways to play in the televised event. Ashley Gilliam finished third in her age category at the Drive, Chip and Putt tournament this year. This wasn’t Ashley’s first time in the winners’ circle. Last year, as a twelve year old, Ashley was TGA (Tennessee Golf Association) player of the year for golfers under fifteen. Of the five TGA tournaments she played last year, Ashley won three and finished second in the other two. You might be wondering how an eighth grader could devote the time needed to garner such success. What about school, you ask? Ashley is a student with International Virtual Learning Academy, an online private school. This educational choice allows Ashley to schedule her learning around her practice and tournament schedules. She is able to play golf several hours a day when the weather is best. On days that are less inclement, she can spend more time on school work. Because IVLA is an online school, she has access to her coursework even when she is traveling for a tournament. Ashley is one of many IVLA students who are pursuing their athletic dreams. IVLA is now able to better help student athletes achieve their goals by offering courseware approved for National Collegiate Athletic Association eligibility. NCAA guidelines for approval are stringent and very few online schools have passed muster. IVLA is pleased to be among the few. For more about IVLA’s NCAA approved courseware, click here. Students hoping to qualify for NCAA programs apply for eligibility while in high school. Eligibility qualifications include proof of amateur status, course requirements, and performance on SAT/ACT testing (according to a sliding scale). Click here for more about NCAA eligibility. What makes IVLA a great choice for student athletes? Flexibility – As in Ashley’s case, student athletes can tailor their learning around their practice and tournament schedules. Support – Each course at IVLA is supported by a certified or highly qualified teacher. In addition, each student has a mentor who works closely with the student and his or her family. Accreditation – Graduates of IVLA receive a college preparatory diploma accredited by AdvancEd. Success – The engaging, multimedia learning platform motivates students. Immediate feedback gives them confidence. Individualized – Because the online curriculum is self-paced and mastery-based, each student receives whatever they need; whether extra practice to acquire a concept or skill or opportunity to excel. Team – Although the instruction is one-on-one, IVLA students are not alone. In addition to their parents, teachers, and mentor, each IVLA student has a “class” of students to whom they belong. This homeroom meets on a regular basis in a virtual classroom where their mentor facilitates various learning activities. International Virtual Learning Academy is a fully accredited online school for students grades K-12. Families with IVLA choose from six online curriculum programs. Certified and highly qualified teachers support each course. In addition, each student has a mentor who works closely with the family to track progress and provide cooperative learning opportunities with other students in a virtual classroom experience.